Children will be instantly attracted to the close-up photographs of unusual creatures contrasted on black backgrounds in Glow, a nonfiction picture book featuring bioluminescent animals such as lanternfish, atolla jellyfish, vampire fish and the glowing sucker octopus. Beck explains on the first page that "bioluminescence is when living things make their own light" or glow. The book then provides readers with the different ways animals use bioluminescence to hide, attract others, hunt and call for help. The hybrid nonfiction text blends narrative and expository styles. The narrative is printed in a large font and uses a controlled vocabulary making the text accessible to young readers. Expository captions use science terms and a more complex vocabulary to provide readers with additional information making this a book that will appeal to both young children (gr. K-2) and older readers (gr. 3-5). 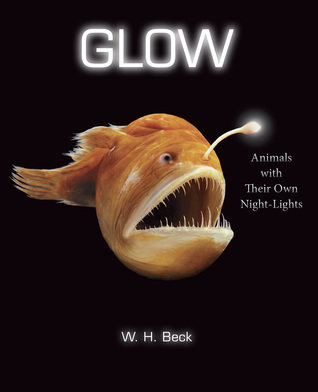 Glow would work as a nonfiction read aloud in story times or science classes, and it is certain to inspire children to learn more about the animals described in the book. Visit W.H. Beck's site to learn more about Glow.